Everyone in Brooklyn was in Sunset Park this past Sunday night to see FKA Twigs perform Congregata for Red Bull Music Academy Fest this year. The lines were wrapped around the corner, the space, though 13,000 square feet, was packed and sweltering. It’s no surprise then that instead of going on at the scheduled time 8:00 pm (but what can you do when you have those lines) Twigs didn’t take the stage until 10 pm. The sun had long gone down and the enigma that was FKA Twigs began her performance, and what was surely the center of focus for all of this years RBMA festival. Through 2 hours, FKA Twigs performed her discography, ranging from the most recent to the song she made in collaboration with Google Glass. 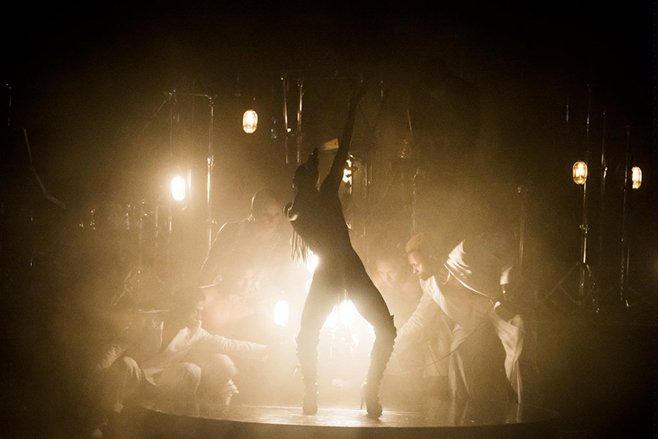 It’s hard to distinguish between what the focus of the show was because her dance choreography was impressively matched to her vocal performance. As the lights dimmed at the beginning of her set, a lone violin serenaded the enthusiastic crowd, before FKA strolled in. And then things went from slinky and seductive to sultry and sensual. With no ventilation in The Brooklyn Hangar things got hot quickly. FKA Twigs takes a comprehensive direction in her music. Instead of relying on her voice, or the backing music, FKA Twigs incorporates her body into every movement, as if the closeups of her lips, or the ways in which the viewer is only offered a quick glimpse at a time of her exposed flesh are fundamental to the message of the song. For Congregata this was taken to the extreme, her backup dancers moved flawlessly from pop vogue to klowning and krumping, while FKA twirled in her jewel-lined bodice. For various songs her backup dancers were props for the message, FKA sensually draped herself over well toned dancers, pushing them around, directing their movement. Everything about FKA Twigs is composed and calculated so it’s refreshing that Congregata offered a complication. Yes the 2 hour performance was flawless in execution but live FKA Twigs is more than just an emotionless singer, she vibrates herself into each song, into each movement. Congregata seemed aware of it’s surroundings in Sunset Park, sandwiched between the bustling exhaust spewing Gowanus Expressway and the unhygienic Gowanus Canal, the movement was very much a part of New York City. FKA Twigs, sweaty and probably exhausted, paused during the show and gave a shout out to the city, and everyone who helped make her performance happen. Her words, genuine and free, brought everyone together.